Discover "Coteau de Chéry" and "Clos Chanson", two lands producing each an exceptionnal white wine. The legend began at the time of the Roman Empire. 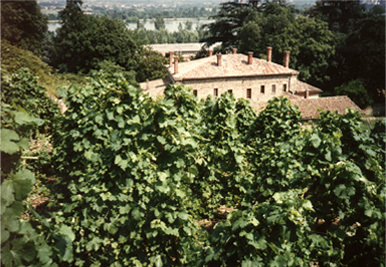 Due to the growth of the number of vineyards in Gaule and a general overproduction in the Roman Empire, it was decided that half of Gaule’s vine stocks must be removed. However, the Emperor Probus demanded that a single hillside must be preserved, his “Cherished” hillside, overlooking the Rhone Valley, producing an extraordinary wine. Since this time, vine stocks have continued to prosper on this hillside and nowadays the legend lives on as Condrieu “Chéry” is one of the 100 Legendary Wines listed in the Solar guide by the leading sommeliers from the Taillevent wine cellars in Paris. Built on the ruins of a feudal castle, this imposing building encloses an ancient vineyard and terraces planted with old vines of the fabulous variety called Viognier. 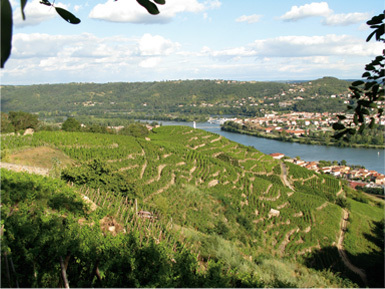 André Perret took control of this famous vineyard in 1986 in order to cultivate it. From this place, every year, comes the exceptional wine combining flavour and subtlety, called “Clos Chanson”.